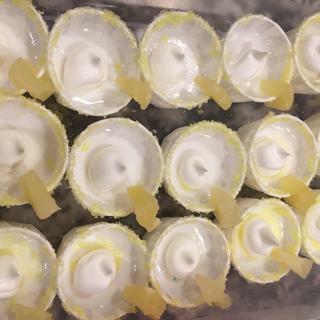 This simple jello shot mix is the key to delicious pina colada jello shots that will impress your guests and improve your party throwing cred. This simple jello shot mix is the key to delicious pina colada jello shots that will impress your guests and improve your party throwing cred. Just follow the directions on the package and you’ll have incredibly tropical jello shooters to enjoy. Greatness doesn’t get any easier! This packet (which makes about 35 one-ounce servings) is a non-alcoholic gelatin powder that tastes great on its own. But if you’re after some boozy fun, just add your spirit of choice and enjoy! Glad to hear you and your guests enjoyed the flavor! The 30-35 servings stated on our site and the packaging is if you're serving 1oz jello shots. We will work to make that more clear on our product pages. Thank you for your feedback! Cheers! WOW, great flavor especially when I added pina colada mix and coconut rum. I placed them in the refrigerator for four hours and when I served them at the party, WOW....a big hit.Needless to say I’ll be a repeat customer because of taste, value and fast shipping. Glad to hear you enjoyed the jello shots! It looks like the remaining packages were delivered yesterday. If you haven't received them yet, please give our customer care team a call at 877-636-3673 and they will be happy to help. Thanks for shopping at KegWorks! Cheers! Pina Colada Jello is hard to find. So my wife seen that you carried this Jello. We decided to try it. We make a lot of Jell-O shots. You are the only online store that sells this flavor, hopefully it arrives by Thursday!!!! This flavor is hard for me to find locally. Thanks for such a great variety! I am looking for a good flavor and hopefully this is the one. Sorry, new to this. What other ingredients would I need to make this jello shot? I used pineapple Malibu and a cherry or pineapple tidbit dropped in the bottom of my cup. Everyone loved them! The fruit in the bottom was a little surprise! You can also use different flavors of Malibu! Have fun with it! All you need is alcohol, and the stuff you need to make normal jello (pots, measuring cups, and something to put jello in). I suggest rum, however you can use whatever suits you, but try not to get too carried away. Kegworks has the best variety of jello shots flavors! You can also use Absolute Vodka! Drop a cherry in the bottom of the cup! Appletini flavored jello shot was a favorite! Does this come in box or just a bag? BEST ANSWER: This comes packaged in a bag only, no box.